As I was looking through a cookbook for my Pampered Chef brownie pan, I found this recipe and thought it would make a good snack tonight. 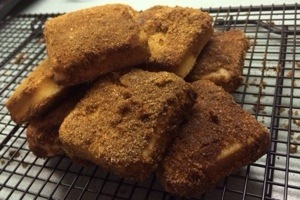 Overall, the recipe was simple, quick and delicious!! 1. Prepare all supplies and preheat oven to 350 degrees. 2. 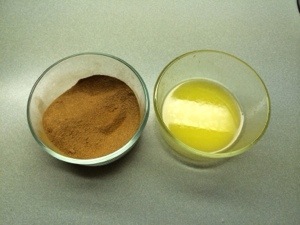 Mix together dry ingredients of flour, baking powder, salt, cinnamon, and nutmeg. 3. As wet ingredients of oil, granulated sugar, egg, and milk. 4. 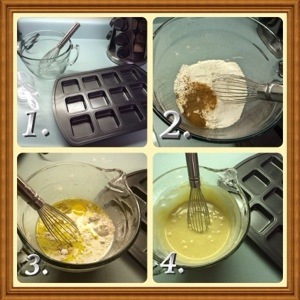 Mix all ingredients together with a whisk. 5. 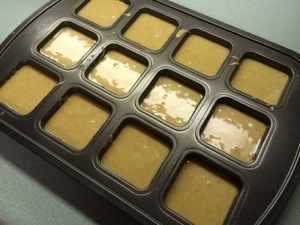 Divide evenly between the 12 brownie pan wells and bake for 10-15 minutes. Melt the butter in one dish. In a 2nd dish, combine the cinnamon and sugar. 7. When loaves have finished baking, remove from pan immediately. Dip tops into butter then dip into cinnamon sugar. Serve warm.